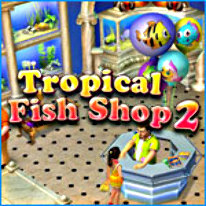 Organize a tropical fish shop! Help Annabelle and Harold organize a tropical fish shop! Annabelle and Harold have moved their shop into a new spacious building. Full of determination, our heroes get down to business again, and this time they will have to cope with a difficult task: equip and arrange an even bigger shop! This will be the beginning of a new stage in their life full of challenging events, amazing adventures and interesting challenges! In this exciting game you can give your shop a unique look, participate in the diver's competitions, solve many various puzzles, and find items to help the sea creatures get out of trouble!